Banner Engineering has been providing sensors and solutions to industry for more than 50 years. The Company philosophy has always been one of listening to customers’ needs and delivering custom built solutions when required. This has resulted in Banner becoming globally recognised as a leader in the field of process and industrial automation. WLS15 - Low profile strip-lights in a rugged design. 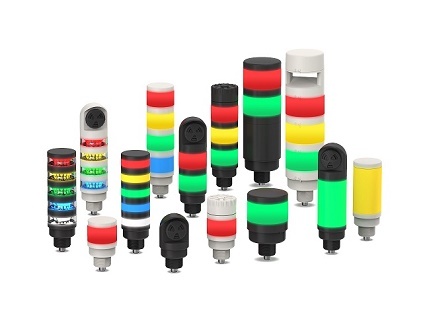 K30 & K50 LED Indicators, multiple colours in a single device. TL70 - Modular Tower Lights with Programmable Audible Segment. The new WLS15 from Banner Engineering is a professional grade LED strip-light that makes it easy and very cost-effective to illuminate equipment and work spaces for improved efficiency, productivity, and safety. The sleek, low-profile design enables installation in confined areas without disrupting the work environment, or obstructing sightlines. IP67 rating is achieved via a sturdy aluminium inner frame and sealed in shatter resistant, UV-stabilized, polycarbonate shell. Utilising RGB technology, the K30L2 & K50L2 LED Indicators offer the choice of seven standard colours, red, green, blue, yellow, cyan, magenta and white, in a single device using just three inputs. The new IO-Link versions offer exciting enhanced capabilities such as millions of colour choices and animation options. Clear, uncomplicated wiring enables quick, hassle free installation and allows users to consolidate controller outputs. The K50 (Gen 2) touch buttons employ Smart Electric Field Sensing technology giving excellent immunity to false triggering caused by the build-up of detergents, oils and other foreign materials as well as exposure to direct water spray. It also improves actuation performance with gloves. Just released is a low-profile (17 mm) design, ideal for use in panels, cabinets and other limited space applications, or where the preference is to have a touch button with a flat surface. The TL70 is a 70mm, modular LED indicator giving extremely bright and uniform light. Due to its modularity TL70 offers users the flexibility to customise tower lights as required and change positions in the field. The TL70 is also available as a pre-assembled unit for quick and easy installation. A maximum of 5 colours plus an audible module can be incorporated into a single device. The latest development is a programmable audible segment. This easy-to-program module allows users to create a custom audible alert or announcement to correspond with a change in status. An alert can be as simple as a short series of tones or as complex as a multilingual set of instructions. Users are limited only by the length of the sound file of 130 seconds. In a world of mass production where personal customer interface is often sacrificed in favour of automated “tick-box” response it is refreshing to find a company that listens and can provide the exact solution. LED lighting solutions available in the UK from Turck Banner Ltd. - Keeping the customer satisfied.